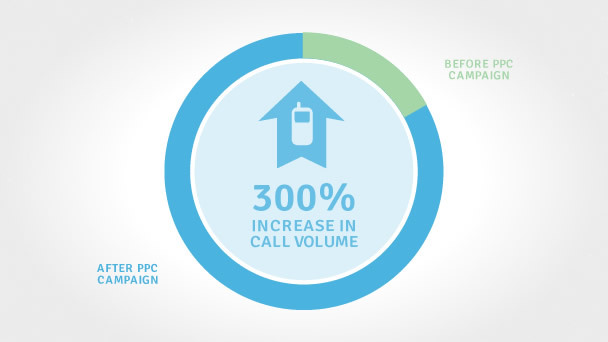 After a review of Medifast’s existing PPC campaign, we developed a strategy to help increase conversions (phone calls) and overall ROI. As a result, year over year traffic is up 125% and call volume has increased 300%. Upon taking over the account, we quickly realized Medifast was misspending a large monthly budget on ValueClick, which wasn’t a source of high quality traffic for our offering. At the same time, we proved that by adding new PPC campaigns, such as geo-targeting popular cities, implementation of retargeting ads, local, and mobile specific ads – we could affect a much better result for them. Within 3 months, we moved the entire ValueClick budget over to AdWords and haven’t looked back. While ValueClick was providing a lot of impressions, we weren’t generating enough conversions. With AdWords, we moved into more of a direct response approach, which resonated much better with our target audiences. As is usually the case, quality beats quantity and the numbers back it up. As of this posting, both San Diego and Nor Cal had great weeks call wise. San Diego had a total of 155 calls and Nor Cal had 105 calls. This was the highest week for San Diego in Q1 so far and the second highest week for Nor Cal. If you think your pay-per-click campaign could be doing better, we’d love to hear from you. The information gave presumes the objective of the financing is to buy a main residence, single-family home in Utah with a 20 % deposit.